Talk about design that’s on top of the world. Rooftop space has never been as much of a hot commodity as it is right now. From ultra-slick lounges and bars to eco-friendly rooftop gardens, the very top of a hotel has become the jewel in many a property’s crown. For the early adopters, it’s time to rethink the design signature for those spaces. So, when Gansevoort Park Avenue hired Chris Kofitsas of New World Design Builders, it knew his vision for the 249-key hotel’s rooftop had to do away with the hard edges of the previous design and create something more relaxed and inviting. That started with using more natural materials and warming up the tones in the space, like the blue leather and sunflower yellow that defines the Pool Bar. 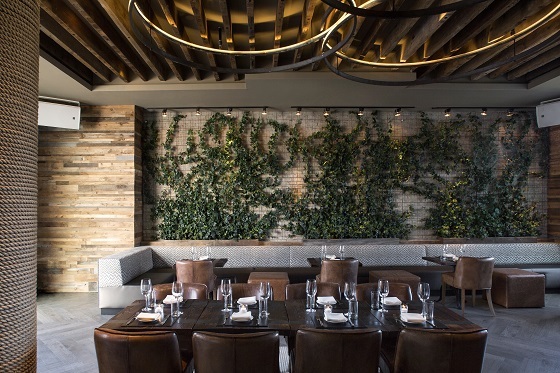 Reclaimed wood in the ceiling of the Ivy Lounge brings in a homey touch. Rope brings in a rustic accent. However, Kofitsas also wanted to work in some of the industrial vibe that’s become synonymous with New York style. Metal walls and wood-and-glass tables pay tribute to the previous version of the space without losing the more informal vibe of the new design.